I’m trying to decide what to name him. So far, Sigge and Sune are the top two possibilities. Anyone have other suggestions? The winter is postcard-perfect here: gently scuplted drifts, snow-covered spruce trees, lights in all the windows of the red and yellow wooden houses. As if on cue, three moose strolled across a neighboring field right when I came down to breakfast this morning. It’s amazing how productive I can be when the goal is going to Sweden on vacation. And those are just the things I remember. Since my flight is delayed from 5:20 to 8:00 tonight, I decided to eat at the airport and skip the inflight meal. (Yes, the airline meal is free and it is Air France food, which is better than your average airline food, but getting a headstart on sleeping is priceless.) This lead to a serendipitous discovery. If you eat at the Boston Dines café in Logan Airport’s terminal E (just outside the security check-in), your server will sign your receipt, which you can then present to the TSA agents who will allow you to use the first class security line. I’m not sure if this is a limited-time-only perk or if it kicks in when you spend a certain amount of money (I spent just over $20), but it’s worth knowing if you have time to eat and the sercurity line is looking long. In the end I don’t think it made much difference for me. Because I arrived so early, and because so many flights have been cancelled, the line wasn’t anywhere near as long as I’ve seen it. I did feel special, though. And, to think, in a normal year I don’t start feeling that 35°F is blissfully balmy until January or February. It’s not just soul-crushingly cold weather, it’s a chance to practice for my upcoming trip to Sweden. How can I not want to read a book where the villain is a kakapo?! 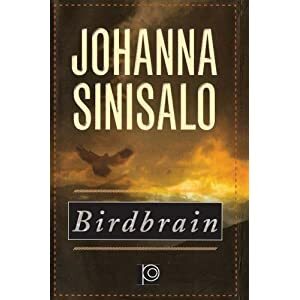 Set in Australasia, this is the story of a young Finnish couple who have embarked on the hiking trip of a lifetime, with Heart of Darkness as their only reading matter. Conrad’s dark odyssey turns out to be a prescient choice as their trip turns into a tortuous thriller, with belongings disappearing, and they soon find themselves at the mercy of untamed nature, seemingly directed by the local kakapo—a highly intellegent parrot threatened with extinction. This is a skillful portrait of the unquenchable desire of Westerners for the pure and the primitive, revealing the dark side of the explorer’s desire—the insatiable need to control, to invade, and leave one’s mark on the landscape. But what happens when nature starts to fight back? A fabulous portmanteau of fyllo (drunk person) and filosof (philosopher), a fyllosof is a drunk person who makes elaborate philosophical pronouncements. As drunks are wont to do. As a fan of both science and science fiction, I’m amazed by how often real, live creatures here on earth end up seeming more fantastical (or scarier) than anything invented by fiction. At least once a week, news about some mind-blowing animal (or occasionally plant) discovery pops up in my RSS feed. Lately, I’ve been fascinated by posts about super-conducting hornets, body-snatching fungi, and photosynthesizing sea slugs. Today’s example of science fact’s turning out to be stranger than science fiction is the moray eel, with it’s strange pharyngeal jaws that give it a decided resemblance to a well-known film monster. I remember reading an article about this when the scientists who discovered the eel’s anatomical idiosyncracy. It wasn’t until I saw this delightful, hand-drawn animation, though, that I got a better idea just why a moray would need to evolve this feature. And, just in case you had any doubt, I absolutely want to take that class now! The video somehow manages to be both disturbing (intimations of violence) and exhilarating (those drums!). I’d describe the visual style as something that Kenneth Anger and Maya Deren might come up with if they were making a mash-up of Beach Blanket Bingo and Tarzan together. When I get famous, which will happen soon enough, I’m going to go ahead and shave my head. talking to a 50-something couple who look like they’re regretting striking up the conversation.